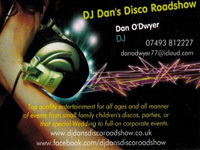 "Top Quality Entertainment For All Ages And Events"
My name is Dan O'Dwyer and I am the owner and full time professional DJ at DJ Dan's Disco Roadshow in Kings Lynn, Norfolk. I have over 20 years experience of having worked in the music industry from playing in bands, being a solo artist, sound engineer and DJ and have pretty much played at every type of event and venue over that time! Not all mobile DJs or mobile discos are the same. I have modern, professional grade equipment for reliability and quality. I also confirm all bookings in writing. My aim is to provide top quality entertainment for all ages and can cover all type of events from small family children's discos, parties or that special wedding or corporate event and will tailor my show to meet your requirements aiming for 100% satisfaction. So, if you are looking for a mobile disco for your forthcoming event please do not hesitate to get in touch with details of when, where and what you require for a free no obligation quote. Required by many venues, DJ Dan&apos;s Disco Roadshow has a current PLI policy with AMP DJ in the amount of £10 million. Also required by many venues, DJ Dan&apos;s Disco Roadshow has supplied satisfactory evidence of holding current PAT inspections of their equipment dated within the last 12 months. A Method Statement outlining DJ Dan&apos;s Disco Roadshow&apos;s Health & Safety procedure for setting up disco equipment has been provided. Why do people choose to book DJ Dan&apos;s Disco Roadshow? As he is in the next village and we want to keep everything as local as possible. Plus he has great reviews, was easy to talk to and can give us everything we require. Better Price and a more personal touch with his correspondence. No reason really all quotes similar! "Nice and polite an easy person to talk to"
"Thankyou for the very kind words! I'm so glad we met your expectations and you had a great night! " "I would highly recommend DJ Dan, we had a very specific playlist and Dan was so accomodating, nothing was too much bother, a great DJ and a very nice guy"
"Thankyou so much for the very kind words! It was a great night and a real pleasure to be part of your big day!!! " "Me and my guests were very happy with DJ Dan. He had perform very well, way beyond expectation. I would definitely recommend him to everyone/anyone who is looking for a dj to provide musics to your events. I would hire him again in my future events thank you." "Thankyou so much for the kind words. I'm so happy i not only met but exceeded your expectations!!!! It was a brilliant evening and a privilege to be part of your celebrations!!! " "DJ Dan was great- very friendly and was easy to book. Did a great DJ set at the party and everyone had a great time." "Thanks! It was an absolute pleasure to play at your Christmas Party! A great night indeed!!!!" "Couldn't of asked for a better service. Dan was excellent. He insured I got exactly what I wanted, from the music choice to the lighting. 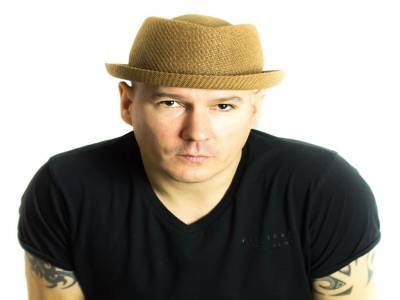 I would definitely recommend Dan if you are looking for a DJ for your party. " "Thanks for your kind words Richard, I'm so glad you had a great evening! Wishing you a very happy Retirement!!!" "Dan was really excellent, communication before the event was detailed and relevant, he arrived very promptly and set up swiftly, and catered for all our requests. He was also great fun! Thanks Dan again for a great night." "Many thanks indeed for your kind words! I'm so glad you had a great time!!!! " "Very good DJ, very punctual, very polite, music provided was within line of what we requested, competitive prices. Highly recommended. Thank you Dan ! " "I am so pleased you have a great night! Many thanks for the kind words!!!" "out standing service , music DJ Dan played was a fab mix for all ages that was at the wedding , especially as we had given him no idea of what we wanted apart from the weddings song , he looked at the guests and knew straight away what music to play for all , the guests have all complemented ace music playing played , and would defiantly re book for any occasion that came up , DJ Dan we very helpful and very polite top service provided through out from beginning to start Thank you for providing a fab service at our Dad's wedding "
"Thankyou so much for the very kind words, it was an absolute pleasure!!! I am so pleased that you, your friends and family all had a great time!!!" "Good music, very knowledgeable and helpful"
"Many thanks for the kind words! I am so pleased that you had a good time!" "Dan Dwyer is a fantastic dj and one I would definitely like to use again. Cannot thank him enough 5***** all the way Thank you so much for sharing our day." "Thankyou so much for the kind words! I am so pleased you had a brilliant day. An absolute pleasure to be part of your special day... Thankyou!!!" "I booked Dan for my sons 18th birthday party and was not disappointed. He delivered a very professional service from start to finish. He had high standard of equipment and lighting and provided a wide range of music choices for all ages. I would not hesitate to recommend Dan for any function big or small. " "Thankyou so much for the kind words! I am so pleased that you, your son, family and friends all had a great time... The pleasure was all mine!!!!!!!" "Dan is a excellent DJ and tailored his disco perfectly to our requirements ...we all had a great time "
"Couldn't of asked for a better DJ. Dan was great and would definitely recommend him to friends and family. Music selection was brilliant and had our guests, young and old, dancing the night away! " "D.J Dan was an excellent choice, very friendly and accommodating, i would certainly recommend him to family and friends." "Thank you Lisa for your kind words. Very much appreciated!!!! " "we were not disappointed. His music was fantastic and catered for the numerous age groups at our party. We would definitely recommend Dan and would surely request his disco services at any future events we have. Many thanks Dan"
"Thanks!! Much appreciated! I had a great time too and i'm so pleased you all had a fantastic evening!!" DJ Dan&apos;s Disco Roadshow also offers a range of additional party services not directly linked to musical entertainment. If you are contacting DJ Dan&apos;s Disco Roadshow about an event, it's always a good idea to include the DATE, LOCATION, EVENT TYPE, AGE GROUP and TIMINGS to speed things up!